(Travel + Leisure) -- Tom Hanks dashes through a graceful Roman piazza, past an ancient Egyptian obelisk surrounded by fountains of water-spouting lions, his eyes focused on a church tucked into the corner of the square. Many of the film's church interiors aren't the real deal, but the exteriors often are authentic. Moviegoers know that his character, Robert Langdon, is trying desperately to stop a grisly murder, following a trail of secret clues laid down nearly four centuries ago by the scientist Galileo and the baroque sculptor and architect Gianlorenzo Bernini. What they don't know is that this graceful piazza itself harbors a dark secret. Piazza del Popolo -- and its namesake church, where Langdon is headed -- was built to evict Nero's ghost. This had been the hated emperor's ancient family estate, and his likely burial spot, and area residents had for centuries complained that Nero's evil spirit haunted a pine grove on the site. 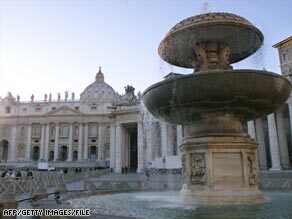 Finally, the Vatican chopped down the trees, exorcized the site, and built the piazza and its church "of the people." These Roman spots are full of secrets and scandals, and while the movie reveals several -- and invents a few more to serve its plot involving Illuminati assassins and Renaissance intellectuals -- the true miraculous and demonic events that took place at them are often even stranger than those Dan Brown's imagination could whip up. However, plenty of the exteriors are genuine, and Roman life occasionally intruded on filming. At one point, Hanks reportedly halted production to help a bride cut through the set -- even holding her train -- so she wouldn't be late for her wedding inside the Pantheon. What the movie doesn't say, though, is that the Pantheon -- an ancient pagan shrine that survived barbarian sackings and became a church in AD 609 -- was pillaged by none other than a pope. Travel + Leisure has rounded up the inside scoop on the movie's most noteworthy sites and crafted a tour that follows in the footsteps of Robert Langdon but goes well beyond "Angels & Demons" to reveal some of the even weirder -- and true -- sagas, scandals, and miracles of the Eternal City.